On March 8 Good Deal receives $800 for the calculators sold to the school on February 25. No other transactions occurred in March. Note that the year-to-date net income causes the amount in the owner's capital account (on the balance sheet) to increase from $2,000 to $2,300. 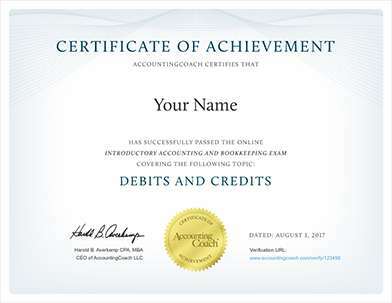 The income statement for the first three months of the business shows a net income of $300. 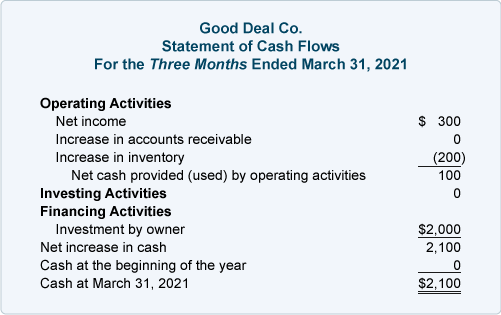 The operating activities section of the statement of cash flows begins with the $300 in net income, but then shows that $200 of cash was used to increase inventory. As a result, only $100 of cash was provided from operating activities. The statement of cash flows also shows that $2,000 was received from the owner's investment in the company. The net cash inflow from the company's operating, investing, and financing activities for the three months ended March 31, 2018 was $2,100. The figure of $2,100 represents the change in cash from the beginning of the accounting year through March 31. 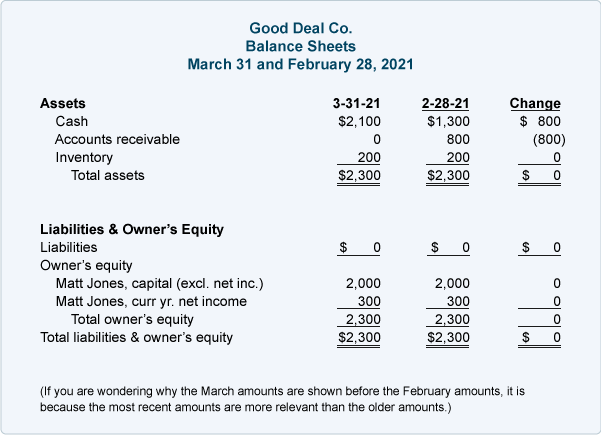 If you look at the March 31 balance sheet, you will find that it confirms this—there is $2,100 in the Cash account on March 31 and there was $0 on January 1. The statement of cash flows presented above was for the three months ended March 31, 2018. 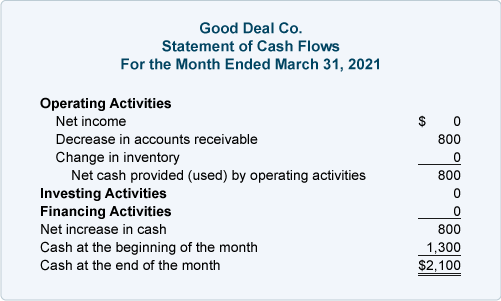 Let's look at how the statement of cash flows would be prepared for just one month—March 2018. Since much of the information for the cash flow statement comes from changes in balance sheet accounts, we need to have the balance sheet amounts for both February 28, 2018 and March 31, 2018. The differences in these account balances from February 28 to March 31 will provide us with information we need on the activities in March. Focus on the "Change" column above. 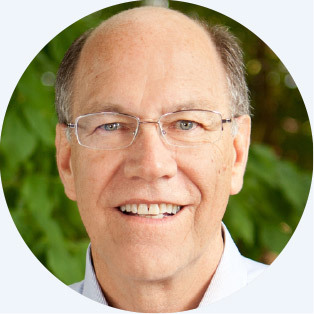 The first amount, a positive $800 change in the Cash account, will serve as a "check figure" for the bottom line of the cash flow statement for the month of March. In other words, the cash flow statement for March must end up explaining this $800 increase in the Cash account. The other amounts in the "Change" column will be used on the statement of cash flows to identify the reasons for the $800 increase in cash. Net income for March is $0, since there were no revenues, gains, expenses, or losses. Cash increased by $800 because $800 of accounts receivable were collected during March. There were no changes in long-term assets during March, so nothing is reported in the investing activities section. There were no changes in long-term liabilities or owner's equity; hence, nothing is reported in the financing activities section. The summation of the amounts on the statement of cash flows is a positive $800. This amount agrees to the increase in the Cash account balance from $1,300 on February 28 to $2,100 on March 31.